Keeping your bathroom glass sparkling clean and attractive can be a real challenge. For cracks and chips, consulting with a Houston glass repair company can be a good first step toward restoring your bathroom to its former pristine condition. After a thorough cleaning, however, streaks and smears on your shower glass or mirror can ruin an otherwise immaculate image. Here is one of the easiest and most effective ways to clean shower doors, windows and mirrors in your bathroom and a few things not to do when cleaning glasswork and windows throughout your home. Mix one-half gallon of warm water with one tablespoon of Jet Dry liquid and two to three tablespoons of liquid dishwashing or laundry detergent. Jet Dry is designed to work in dishwashers to reduce spotting on glass and can usually be found next to the automatic dishwasher detergent in the soap and laundry aisle of your local supermarket. Concentrated dishwashing detergents can be used for even greater cleaning effect. Rinse shower doors or mirrors with plain warm water. Then apply the Jet Dry-detergent mixture in an even layer over the glass surface, directing special attention to areas with existing spots or soap residue. Finish with a rinse of warm water to remove all of the cleaning mixture. 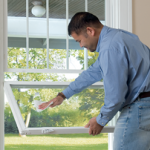 No towel drying is necessary; instead, allow the glass to air dry for a natural streak-free surface. This glass cleaning process can leave your bathroom looking its best while streamlining your regular housekeeping routine. 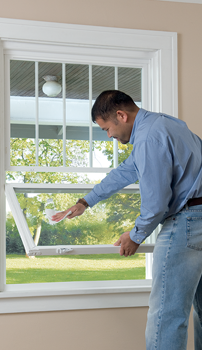 Similar methods can be used to clean exterior windows and glass items throughout your Houston home. Using metal blades or metal objects of any kind to remove materials from glass can leave scratches and, in some cases, may even create cracks and chips in the surface. Glass manufacturers advise against the use of these tools when removing debris from mirrors and shower doors. Abrasive cleansers can also dull the shine of glossy surfaces and can cause damage to matte and embossed shower doors. For coated shower doors, be sure to read the manufacturer’s recommendations on cleaning and maintenance. This can help you avoid costly repairs or replacement costs for these essential elements of your bathroom routine. Even after a thorough cleaning, severely discolored or dull glass may not provide the look you want for your bathroom area. Chipped or cracked glass in this area can even present hazards for you, your family and your guests. Working with a company that specializes in replacing Houston shower doors and enclosures can help you achieve the most beautiful and elegant results for this necessary room. Our experienced and talented technicians can provide you with the best possible solutions for all your glass repair and replacement needs. Contact us today or stop by one of our two brick-and-mortar shops to discuss your bathroom renovation project with us. We think you will be glad you did.